The Murchison meteorite fall occurred on September 28, 1969 over Murchison, Australia. Over 100 kilograms of this meteorite have been found. 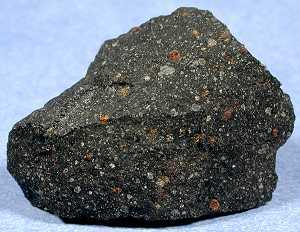 Classified as a carbonaceous chondrite, type II (CM2), this meteorite is of possible cometary origin due to its high water content of 12%. An abundance of amino acids found within this meteorite has led to intense study by researchers as to its origins. More than 92 different amino acids have been identified within the Murchison meteorite to date. Nineteen of these are found on Earth. The remaining amino acids have no apparent terrestrial source. Murchison, like all carbonaceous chondrites, is of a very primitive nature. A close look at the dark interior shows an abundance of chondrules and CAI's (calcium aluminum inclusions).